Lifeprint is a Bluetooth printer that makes it easy to share memorable, happy moments from your smartphone with friends and family. By using the Lifeprint app you can collect all your photos and video from your camera roll, Snapchat, Instagram, Facebook and Twitter so they are all easy to access in one place. You then simply select either a photo or video and then press print. The photo will transfer to your printer wirelessly and then print out. Lifeprint also uses Augmented Reality to make the photos you take magically come to life in your hands; this is called ‘Hyperphoto™’. This means you can print video clips and then use your phone to watch the clip. To do this you simply use the Lifeprint Photo app, select a video clip and trim it down to a maximum of 15 seconds. You can then select a frame from the video to print and then use the player in the app, point the iPhone’s camera at the print and then watch the clip from your phone. This is an amazing feature and my oldest daughter loved creating her own Hyperphotos. 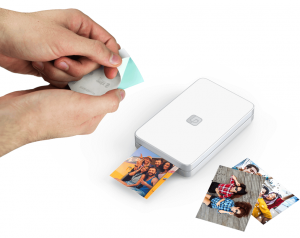 Another fabulous feature is that you can also send your photos and videos to print on your friends or family’s printer. So wherever they are around the world, you can send them a cherished memory for them to enjoy too. Lifeprint also allows you to customise your prints with filters, memes, stickers and more. So you can be as creative as you like with your photos before printing them. Amazingly Lifeprint requires no ink to print. You just put the paper in and print. The photos are ‘sticky backed’ so you can stick them anywhere you want. Both my children love this feature and have stuck their favourite prints in their diaries and favourite notebooks. My son also wanted to stick a print of himself into his cousin’s birthday card! Lifeprint is available in 2 sizes; 3 x 4.5 and 2 x 3. 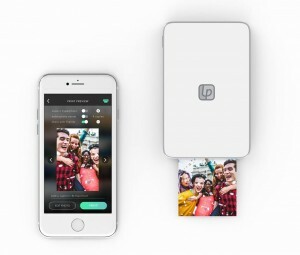 Lifeprint is portable and is the perfect accessory for any concert, festival or party. The RRP starts from £129.99.